Home > Ham Radio > Battery Packs > ICOM > BP-256 : 7.4v 1620mAh long-life Li-ION battery for ICOM IC-92AD radios, etc (worldwide versions). 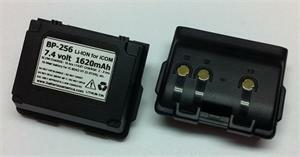 BP-256 : 7.4v 1620mAh long-life Li-ION battery for ICOM IC-92AD radios, etc (worldwide versions). The BP-256 is a 7.4 volt 1620mAh Lithium ION rechargeable battery pack for the ICOM IC-92AD (D-STAR) handheld radio. Fits worldwide versions. Re-charges thru the radio, or with the new EMS-256 charger, or with the ICOM desktop rapid charger (BC-177), or thru the radio via CP-12L or CP-11L DC power cords. Pricing is for 1 battery pack. Picture shows 2 sides of the battery. OUT OF STOCK. 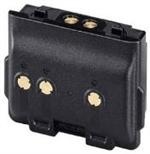 CBE-256:Battery Eliminator for the ICOM IC-92AD radios. It enables you to operate the radio directly from a 12 volt DC socket. Has built-in noise filtering circuitry, and voltage regulation. Clips onto radio just like a battery. Out of stock. EMS-256 : Desktop Rapid Charger for ICOM-style BP-256 batteries. Charges battery alone, or you can insert the entire HT into the charger. Includes AC-DC adapter for worldwide use.